BEST SELLER! Snow Smokey Red Berry Coordinated Greenery Products by Liberty Floral will give you that designer look for your home or office. Snow Smokey Red Berry products feature red berries, pine, PLUS snowy clumps on branches. The 6" garland is perfect for fireplace decoration, front door, interior doorways, porches, etc. Check JMB Quality Imports, LLC for our other "Snow Smokey Red Berry" listings. Use one element or all three. Try garland on your doors and mantel, hang a wreath on your doors, and put garland on your buffet with 2 or 4 trees. Add ambience with candle rings in the dining room or on your coffee table when entertaining friends. Greenery is snowy, longer needle pine accented by red berries and pinecones. If you need larger quantities, let us know through Amazon. 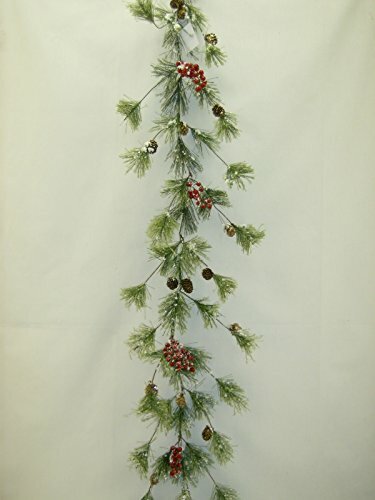 6 ft snowy Christmas pine garland with red berries...BEST SELLER! If you have any questions about this product by Chinese Unknown, contact us by completing and submitting the form below. If you are looking for a specif part number, please include it with your message.